from the wilderness of Siberia! "But a certain Samaritan, as he journeyed, came where he was. And when he saw him, he had compassion. So he went to him and bandaged his wounds, pouring on oil and wine"
"As I see it, every day you do one of two things: build health or produce disease in yourself." This site is for people who are looking for effective, time-tested and proven answers to their questions with regard to wellness and health maintenance. It is also for people who realize that there must be something wrong with many of the official dietary dogmas and believe that real answers to the problems of healthy living are to be found in striking the right balance between the best achievements of modern medicine and the traditional approaches to health and healing practiced throughout the world. On these pages, we will share the results of many years of our search for traditional, nutrient-dense oils that allowed generation after generation of our ancestors to avoid the common health pitfalls of modern society, including suboptimal performance of the gastrointestinal (GI) tract, poor metabolism, and impaired digestion*. By finding out more about our products and our holistic approach to health and well-being you will learn how to achieve and maintain wellness with the help of healthy, traditionally produced, and 100% natural oils from plants grown in pristine areas untouched and unspoiled by modern civilization. You will also see that making these nutritious oils part of your regular diet may not only help you to maintain a healthy digestive system, but also provide you and your family with many other important wellness benefits. build health or produce disease in yourself." A new epidemic of truly frightening proportions has taken over the United States. According to the U.S. Government data, an estimated 129.6 million, or 64 per cent of Americans are either overweight or obese. A new study released by the Department of Health and Human resources (HHS) Centers for Disease Control and Prevention shows that deaths due to poor diet and physical inactivity rose by 33 percent over the past decade and are now number three on the list of leading preventable cause of death in America. Despite several decades of intense efforts to lower the incidence of obesity and promote weight loss through lowering the amounts of fat and cholesterol in our diets, obesity in America is still on the rise. Every now and then, a new "miracle" product or diet promises to solve the obesity crisis, but eventually all of them fail. The underlying reason for this failure is a lack of understanding of the vital physiological processes behind eating, metabolism and weight management. We cannot win the battle against obesity and disrupted metabolism by ignoring the basic principles which form the foundation of how food is perceived and utilized by our bodies. Therefore, any product designed to "force" or "coerce" our bodies into losing weight (and a vast majority of them try to do just that) is doomed to fail. The only way to optimize metabolism and achieve vibrant health is to enhance the ability of our bodies to assimilate the nutrients that we need, unlocking its inherent potential to promote healing and maintain itself in perfect working order. 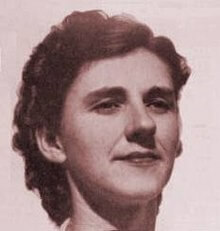 Adelle Davis, one of the 20th century pioneers of the movement towards healthier eating, once said: "As I see it, every day you do one of two things: build health or produce disease in yourself." Thus, when we try to "outwit" our own body by denying it the nutrients it needs (which is the case with macronutrient-restricting low-fat and low-carb diets) or poisoning it with artificial chemicals with harmful side effects, we are doing nothing more than "producing disease" in ourselves. On the contrary, when we help our bodies to unlock their true self-healing and health-building potential, they naturally come back to their perfect balance of vibrant health and well-being. What's very important to understand is that this potential cannot be activated by staying away from all fats. On the contrary, health-promoting fats (as opposed to harmful synthetic fats found in processed foods) are the very keys needed to unlock this self-healing potential of our bodies and put it to maximum use. The "fat-free" approach did not work. What works is the "right fats" approach! Our bodies are designed to be lean and beautiful, not heavy and slow. If allowed to work without impediment in an ideal environment, they will naturally seek to regain their original healthy balance. However, in our society, dominated as it is by fast food, sedentary lifestyles, and "comfort eating", bringing back this harmonious balance and achieving the ideal state of wellness and optimum body performance is often very difficult. We need all the help we can get in order to optimize our food intake, boost our metabolism and digestion, and provide our perfectly designed bodies with all the essential nutrients they need to function to their fullest potential. When we try to describe a perfectly functioning system, we often refer to it as a "well-oiled machine". This metaphor gives us the key to understanding one of the most important underlying principles of natural healing and healthy metabolism. To be able to achieve healing and reach its optimum state, our body must be WELL-OILED. By that, we mean that it must be supplied with the right fats. Not only are these "good fats" essential for healthy metabolism, but they are also vital for maintaining wellness. diet wastes the skill of his doctors." "This delicious, golden-colored oil is pressed from the small yet very nourishing and nutrient-packed seeds of Siberian pine (Pinus Sibirica), known in Russia as “the King of All Trees”"
Imagine yourself in a beautiful Northern forest. You are standing there in bright sunshine, surrounded by tall, mighty trees, and the air around you is so pure, so full of health and radiance, that you cannot help the feeling of actually being able to touch it, feel it, taste it. You are finally there. You have found it. You are in a Siberian pine forest. The beautiful Siberian pine (Pinus Sibirica) is truly a miracle of Nature. A typical Siberian pine is about 100 to 150 feet tall, reaching five to seven feet in diameter. The seed-bearing cones would only grow at the top 4 to 5 feet of the tree's total height. Siberian pines grow very slowly, and their average life-span ranges from 300 to 550 years, sometimes reaching up to 800 years. So, when you are looking at a really old Siberian pine, you know that it was born long before the time when Columbus discovered America. Russian Orthodox monks have to follow a very strict dietary regimen, which prohibits them from consuming any products of animal origin (including meat, dairy, or fish) for more than 200 days out of every year. At the same time, every monk has a lot of daily duties, with many of them requiring hard physical labor. For many centuries, Russian monks have used pine nut oil to boost their stamina and get the energy required to get through their work-filled days. 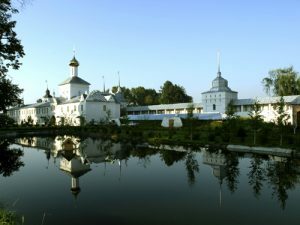 In late 16th century, one of the largest and most famous man-made plantings of Siberian pines was started at Tolgsky Monastery, located on the river named Tolga near an ancient Russian city of Yaroslavl. 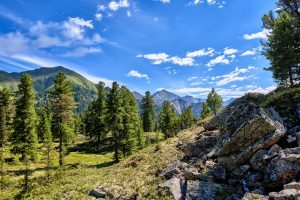 Because of the amazing longevity of Siberian pines, this wonderful "cedar garden" (in Russia, Siberian pines are also often called "Siberian cedars") is still very much alive, and some of the trees (many of which are more than four hundred years old!) continue to produce the hard-shelled, fragrant kernels from which extra virgin Siberian pine nut oil is made. The monastery, frequented by the family of the last Russian Tsar Nicholas II, is still a prominent center of Russian Christianity and a place of breathtaking natural beauty. All the Siberian pine nuts that we use to produce our extra virgin oil are harvested by hand in the pristine wild forests of Siberia. There are no cities or factories nearby to pollute the air and water. There are no roads. Nothing to disturb the unspoiled Northern wilderness. Our pickers take great care to harvest only the choicest Siberian pinecones that will produce the highest-quality nuts and oil. The way we produce our premium quality extra virgin Siberian pine nut oil is truly special and unique. Traditionally, this precious oil has always been pressed from Siberian pine nuts using primitive wooden oil presses. It is widely believed that, to get the oil of the highest quality and value, it is very important not to let the pine nuts, as well as the freshly pressed oil, to get in contact with any metallic surfaces. Only the oil produced by this traditional, centuries-old method can be called “extra virgin pine nut oil”. Through many years of research and experimentation, we have adapted the traditional Russian wooden pine nut oil press to the strict quality standards and productivity requirements of the 21st century. 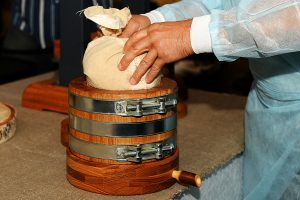 The pressure required to separate the oil from the kernels is provided by a state-of-the art hydraulic system, whereas the “heart” of the oil press – the barrel where the actual pressing occurs – is made of oakwood: exactly the way it was done for many centuries by native Siberians. The resulting oil supplies all of the wholesome, health-promoting* goodness the King of All Trees has to offer, with nothing added and nothing taken away. Some other manufacturers claim that they were able to imitate the original equipment and know-how used by us, but we know full well that this is not true, because this original technology has been our closely guarded secret ever since we introduced this special oil to the US market back in 2004. This is exactly why our company is often referred to as “the original Siberian pine nut oil company”. To provide optimal support for your digestive system and healthy nourishment for your entire body, we recommend taking at least three teaspoons of Siberian pine nut oil daily (with meals or in-between them), with a fourth teaspoon added right after you wake up or at bedtime, if desired. 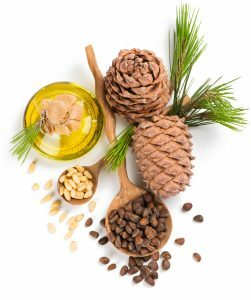 One of the great things about pine nut oil is that, in addition to taking it straight by the teaspoon you may also use it in a variety of delicious and healthy recipes ranging from salad dressings and pastas to pesto and homemade nut butters. Siberian pine nut oil is a gourmet culinary oil that can be used in your kitchen in a variety of creative ways. For example, you could use in baking and light sautéing, or as an absolutely delightful dipping oil. If desired, it can be mixed into olive oil or used instead of it on your salad or in any of your favorite dishes that call for vegetable oil. And, most importantly, Siberian pine nut oil makes every meal you cook more satisfying and nutritious. New in 2019: Introducing Pure Premium Siberian Pine Nut Oil Capsules! Several years in the making, our new Siberian Tiger Naturals Pine Nut Oil Capsules are finally here! 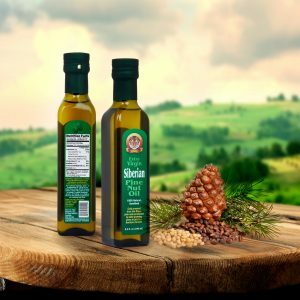 Back in 2004, we were the first company to bring extra virgin, cold-pressed liquid Siberian pine nut oil to the United States and Canada. A runaway success since the day it hit the North American market, it is still our #1 bestseller and a long-time favorite of those who search for natural, innovative solutions to support their digestive wellness and overall wealth. 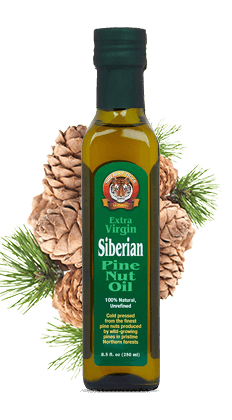 Our liquid Siberian pine nut oil has a very pleasant, agreeable taste reminiscent of fresh pine nuts. Most of our customers are quite happy taking the oil straight, especially considering its unique healing properties. Nevertheless, there will always be those who prefer to take their remedies as capsules. For some of you, it's simply a better, more convenient way to take supplements, while others are concerned about the percentage of biologically active ingredients actually reaching the problematic area of the digestive tract and not being lost along the way. No matter what the actual reasons were, many of you wanted us to make Siberian pine nut oil capsules - and we listened! 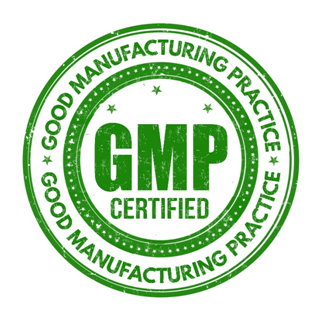 Our pine nut oil softgels are produced using the same high standards of quality and integrity we apply to everything we do as a business. We start with the choicest, hand-picked Siberian pine nuts harvested at the peak of their ripeness and therapeutic activity. Wasting no precious time, we have the fresh pine nuts delivered to our state-of-the-art production facility, which uses the latest technology and the most advanced equipment to make sure that all the health benefits of our extra virgin Siberian pine nut oil are brought to you in their fullest, unadulterated form. We use the no-heat, "true cold-pressing" technology achieved through unique oil presses that are made according to traditional Siberian designs. Last, but not least, after subjecting the resulting extra virgin Siberian pine nut oil to a thorough multi-parameter test for quality, purity, and freshness at our state-of-the-art QC lab, we put it into easy-to swallow capsules specially designed to ensure an optimum, targeted release of the therapeutic ingredients into the GI system. In your digestive tract, our Siberian pine nut oil capsules work just as well as the liquid oil you take from a teaspoon. Only better! Not only are the capsules more "user-friendly" and easier to take than liquid oil, but they also guarantee full delivery of the healing bio-active compounds to the very areas of the digestive tract where they are needed the most, be it the stomach, the duodenum, or the rest of the intestinal system. The capsules are also more lightweight and compact compared to glass bottles, making them easier to take along when you need to take the oil at work or on the go. Our extra virgin Siberian pine nut oil capsules are available in two sizes: 180 count (a 20-day supply) and 90 count (a 10-day supply). The recommended dosage is three (3) capsules thrice daily, with food or in-between meals. If desired, this supplement may also be taken before bedtime. 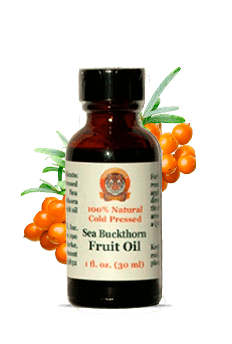 "Sea Buckthorn (Hippophae Rhamnoides) is often referred to as The Ultimate Gift of Nature: various health and wellness-promoting vitamins, minerals, fatty acids, and micro-elements are contained in virtually every part of the Sea Buckthorn plant, including its berries (also called Sea Buckthorn fruit), seeds, leaves, and bark"
Sea Buckthorn (Hippophae Rhamnoides), also known as Seaberry, Siberian pineapple, or Alpine Sandthorn, is a deciduous tree or shrub naturally occurring over very large territories in Europe and Asia. Most scientists think that it originates from the Himalayan Mountains, where its natural hardiness and vigor allow it to thrive on solid rock formations around crystal-clear rivers fed from ancient glaciers, at elevations as high as 14,000 feet. According to the information provided by the International Research and Training Center on Sea Buckthorn (ICRTS), its natural distribution area includes China, Mongolia, India, Nepal, Pakistan, Russia, Ukraine, Great Britain, France, Denmark, Netherlands, Germany, Poland, Finland, Sweden and Norway. The unique features of the plant, especially its combination of high environmental value with nutritional and health-promoting applications, have contributed to the substantial interest and recognition it has received internationally from researchers and health care practitioners. Sea Buckthorn has been traditionally known in China, Russia and Europe as one of nature’s most incredible medicinal plants. * Its small, bright orange berries have been cherished for centuries for their truly incredible healing, nutritive, and therapeutic qualities. 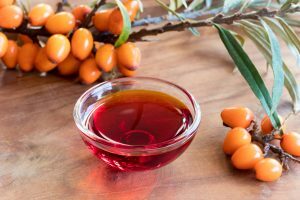 The richly colored oil produced from Sea Buckthorn berries is so abundant in vitamins, antioxidants, and other healing compounds that many believe that Sea Buckthorn must have been created by some ancient plant-breeder. 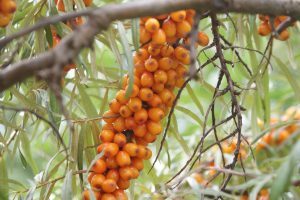 Sea Buckthorn berries have no match in the plant kingdom for their content of carotenoids (pro-vitamin A), phylloquinone (vitamin K), as well as other nourishing vitamins, fatty acids, and micro-elements. 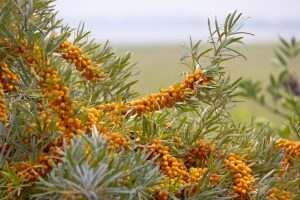 The unique wellness-promoting properties of Sea Buckthorn oil are explained by its almost unbelievable abundance in various biologically active compounds. The ripe berries of Sea Buckthorn contain more than 190 varieties of bioactive substances, of which 106 occur in the berry oil. This number includes six different fat-soluble vitamins and vitamin-like substances, 22 fatty acids, 42 kinds of lipids and 36 kinds of flavonoids and phenols. Carotenoids are organic pigments occurring in brightly colored plants and some types of algae and fungi. So far, more than 600 of them were identified. Their molecular structure makes them very efficient free radical scavengers. Some carotenoids (for example, beta-carotene) fall into the category of pro-vitamin A. From them, our body makes retinol (vitamin A), which is a potent antioxidant and immune system enhancer. 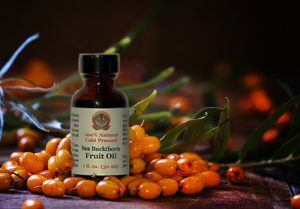 In addition to beta-carotene, Sea Buckthorn oil also contains other types of carotenoids such as alpha-carotene, zeaxanthine, lycopene, and lutein. The total amount of carotenoids in Sea Buckthorn berry oil is many times higher than in any other natural carotenoid source. Vitamin E, a fat-soluble vitamin, is believed to protects vitamin A and essential fatty acids from oxidation in the body cells and prevents breakdown of body tissues. In Sea Buckthorn oil, vitamin E is present in its most active, maximum potency form called d-alpha-tocopherol, whereas most of the vitamin E capsules sold as dietary supplements contain synthetic forms of tocopherol (primarily dl-alpha-tocopherol acetate), which are at best only half as potent as natural vitamin E.
It is thought that vitamin E is capable of synergistically enhancing the action of other biologically active substances. Being an excellent antioxidant, it slows down lipid peroxidation, prevents accumulation of toxins, plays an important role in the biosynthesis of proteins, and provides a much-needed detoxifying effect. Together with vitamin A, it strengthens the immune response and nutritionally supports healthy digestion. Vitamin K1 (phytomenadione, or phylloquinone) is the most active form of fat-soluble vitamin K, playing a vital role in regulating blood coagulation and ATF synthesis. It is also involved in bone formation and repair. It assists in converting glucose in the intestinal system to glycogen, which can then be stored in the liver. Vitamin K1 is on the World Health Organization's List of Essential Medicines, the most effective and safe medicines needed in a health system. In 1943 Edward Doisy and Henrik Dam were given a Nobel Prize for its discovery. The fatty acid profile of Sea Buckthorn berry oil is also quite remarkable. It contains from 35 to 40 percent of a 16-carbon monounsaturated fatty acid called palmitoleic acid, also known as omega-7. The only other known significant plant source of this rare fatty acid is macadamia nut oil, but Sea Buckthorn oil contains almost twice as much (and many times as much as any other source of palmitoleic acid, whether plant or animal). Palmitoleic acid is similar to lipids naturally occurring in skin sebum, and is thought to provide important restoring and rejuvenating benefits for problematic and aging skin. Our richly colored, extra thick and ultra-fresh Siberian Sea Buckthorn oil comes from super-high-vitamin varieties of Sea Buckthorn organically grown in our own orchard high in the Altai Mountains of Siberia. In the former USSR, these special varieties of Sea Buckthorn were a closely guarded secret, because they were developed as part of a special nutrition program for Soviet cosmonauts. Our Sea Buckthorn oil is the first internationally available oil made from these special Sea Buckthorn varieties characterized by the highest vitamin and nutrient content. 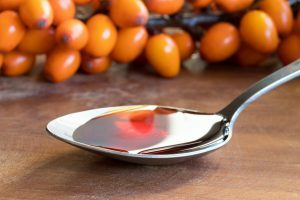 Most other brands of Sea Buckthorn oil currently available in North America are made of berries harvested from wild-growing Sea Buckthorn plants of inconsistent origin and nutritional value. Because of very low yields of wild-growing Sea Buckthorn plants, they are often overexploited and damaged during harvesting, causing serious and sometimes irreversible environmental harm to fragile mountain ecosystems. On the contrary, our Siberian Sea Buckthorn oil is produced from select, highest-grade Sea Buckthorn berries grown in a specially designed, eco-friendly Sea Buckthorn orchard. Our Sea Buckthorn berries are picked at the peak of their biological activity and cold-processed mechanically using our proprietary technology without any chemical solvents, refined carrier oils, or carbon dioxide: nothing added, nothing taken away. The resulting oil is truly unmatched in its purity, potency, and overall quality. Last, but not least, because we have a fully integrated growing and production operation allowing us to keep our costs under control, we are able to offer this exceptional oil to you at a truly unique price: just $79.95 for a full-size 8 oz. bottle (compare at $130-220)! 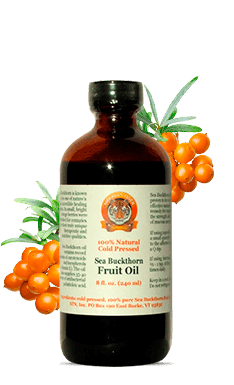 This is an absolutely unbeatable price for 100% pure and natural Sea Buckthorn oil of premium quality and nutritional value. "Siberian Camelina (wild flax) oil an excellent, versatile overall source of health-promoting omega-3 fats and natural antioxidants, including tocopherols, carotenoids, and phosphatides"
Camelina (Camelina Sativa) - also known as wild flax, German sesame, or Siberian oilseed - is an ancient oleaginous (oil-bearing) plant from the Cruciferae family, which has been domesticated and extensively used in Europe for several thousand years. 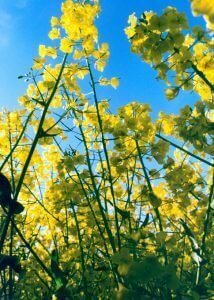 The seed oil of Camelina contains a very generous amount (up to 45 per cent) of omega-3 fatty acids, as well as a potent antioxidant complex making the oil very stable and resistant to heat and rancidity. 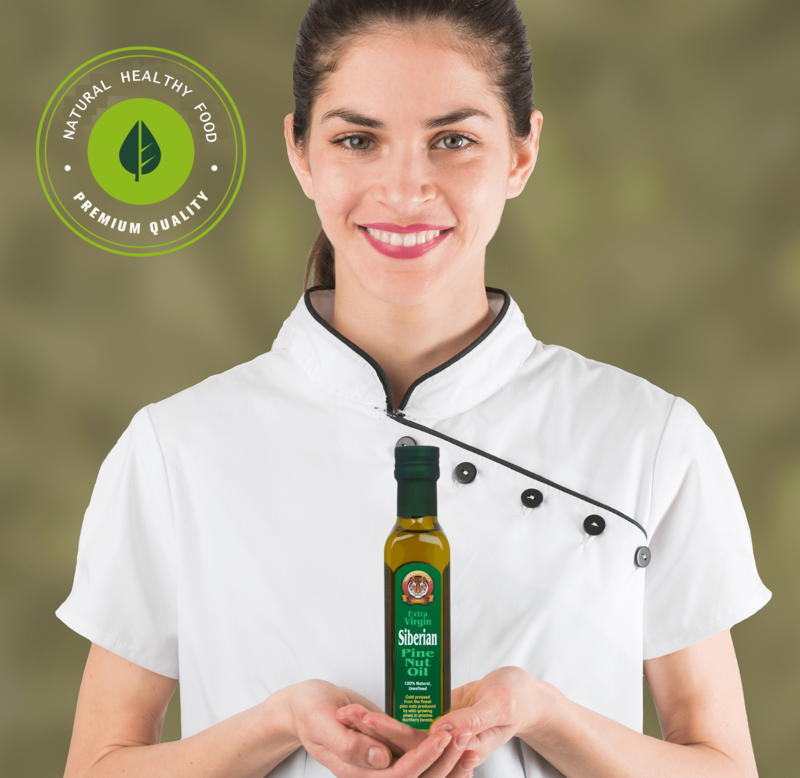 Unlike any other omega-3 oil, Camelina oil is perfectly suitable for use not only as a well-balanced omega-3 supplement, but also as a health-promoting everyday cooking oil. Combined with a delicious nutty flavor, this extraordinary blend of beneficial polyunsaturated fatty acids and high oxidative stability makes Camelina oil an excellent, versatile overall source of both heart-healthy omega-3 fats and powerful antioxidants, including tocopherols, carotenoids, and phosphatides. 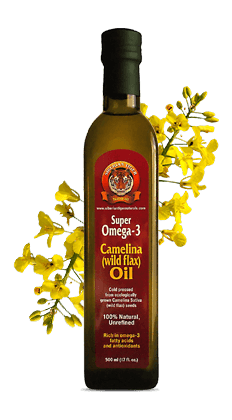 Known as "wild flax" because it is often found growing together with common flax, Camelina, while supplying almost as many omega-3 fatty acids as common flax, is much more stable than the latter, and also tastes much better. This is why we call it "The Stable Flax". Omega-3 fatty acids are in the spotlight of today's natural and holistic approaches to human health. These healthy essential fats have been almost entirely forced out of the everyday American diet by the commercialization of our food supply by the food processing industry. In recent years, extensive research and numerous clinical studies have confirmed that omega-3 fats are involved in numerous vital physiological processes in our bodies. Therefore, adding a certain amount of omega-3 fatty acids to one's diet is believed to be a good way of achieving and maintaining health and wellness. 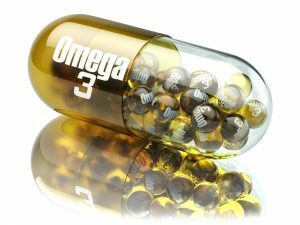 The question of what constitutes the best source of omega-3 supplementation is, however, still being widely debated by scientists, doctors and consumers alike. 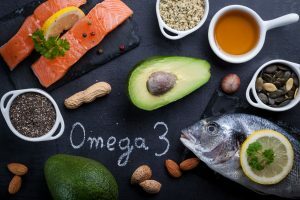 There are two major known sources of omega-3 fatty acids: certain types of fish (and their tissue or organ fat, also called fish oil or fish liver oil), and a number of plant seeds and their oils (flax oil being the best known one). Fish and fish oils (including cod liver oil) are a fairly decent source of omega-3s. One important advantage of fish and fish oil is that they contain the most nutritionally available variety of omega-3s, eicosapentaenoic acid (EPA), which is converted directly into PGE3- the compound responsible for most of the health benefits of omega-3 supplementation. 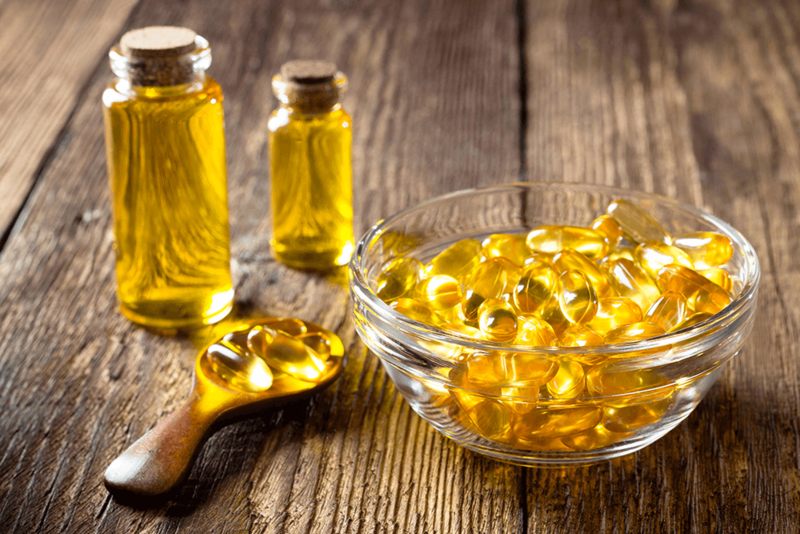 Oils extracted from the body tissues (fish oil) or organs (cod liver oil) of certain fish species are by far the most concentrated sources of long-chain omega-3s (namely, EPA and DHA). Cod liver oil has an additional advantage of supplying large quantities of vitally important vitamins A and D. It is, indeed, an excellent everyday supplement, but, just like with fish, you must be a very careful shopper. There are two major problems with fish oils: contamination with polychlorinated biphenyls (PCBs) and mercury, and rancidity. Some fish oil manufacturers are trying to solve this problem by putting their products through an elaborate process of molecular distillation - a complex industrial method of oil purification. Although this technology guarantees that the contaminants are driven out of the oil, it significantly increases the cost of the product, and, in the case of cod liver oil, drives vitamins A and D out of the oil, forcing manufacturers to fortify it with synthetic equivalents of these vitamins. Furthermore, molecular distillation does not offer a solution to the second part of the problem with fish oils: rancidity. Yes, almost any oil rich in omega-3s (including not just fish oils, but flax oil as well) goes rancid very easily, especially when its natural antioxidants are removed by refining or distillation. This process is known as auto-oxidation, and it generates dangerous and aggressive compounds called free radicals, which negatively affect all molecules around them. Millions of good, useful molecules can be destroyed by the generation of a single free radical. Manufacturers try to counter this effect by avoiding any exposure of their products to light, heat or oxygen, flushing them with nitrogen, or using artificial antioxidants or other preservatives to keep the oils fresh. More often than not, these efforts fail - a fact evidenced by many tests performed on commercially available fish oils. With few exceptions, they become rancid long before you ingest them, making them do more harm than good (this is true for both liquid and encapsulated fish oils). 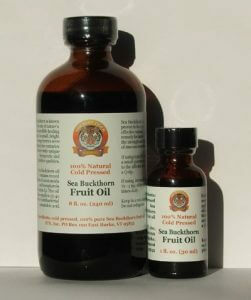 Oxidation is, indeed, a major problem with flax oil as well, for which no solution has been offered so far. The oil is poor in natural antioxidants, and starts going rancid as soon as it is pressed from the seeds. Modern flax oil industry takes many precautions to prevent the oil from going rancid. In many ways, these precautions are similar to the measures taken by fish oil manufacturers. Flax oil is often pressed and bottled in an oxygen-free environment and stored in climate-controlled warehouses to preserve its freshness. Some health food stores keep flax oil in the refrigerated section, where it should be. But this is an exception rather than the rule, and, just like fish and cod liver oils, most commercially available varieties of flax oil, both liquid and in capsule form, do get rancid. And even if they don't, there is no way to avoid oxidation and rancidity once the oil enters your body. Once ingested, it inevitably triggers free radical chain reactions, damaging millions upon millions of healthy molecules. Your body tries to stop these reactions with its own natural reserves of anti-oxidants, such as vitamin E, putting these reserves under an unnecessary and undesirable stress. As a result, the benefits of taking flax oil may well be outweighed by the harm done by free radicals and other toxic by-products of lipid oxidation. Considering the above, one inevitably comes to a conclusion that none of the commercially available sources of omega-3 fatty acids are fully satisfactory and completely problem-free. While it is possible to achieve the required level of omega-3 supplementation using either fish and fish-derived products, or flax oil, it would be highly desirable to have an omega-3-rich oil that would also be more resistant to oxidation and free of toxic contaminants. The good news is that such an oil does, indeed, exist. This is the oil of Camelina - The Stable Flax! From the times of the Roman Empire to the Second World War, Camelina seed oil was a common edible oil all over Europe, and especially in Germany, Scandinavia, and Russia. In Russia, it was much preferred to regular flax oil because of its better taste and higher stability, and commanded a significantly higher market price. Nowadays we are witnessing a growing interest in Camelina and its excellent seed oil which was able to withstand the test of time. In addition to Russia, where Camelina never ceased to be an important source of cooking oil, extensive research of this unique healing plant is underway in the countries of the European Union, as well as in Canada and the United States. Camelina seeds produce a golden-colored oil with a delicate, almond-like flavor, containing up to 45 percent of omega-3 alpha-linolenic acid (ALA). In addition to valuable omega-3s, it is very rich in powerful antioxidants, primarily tocopherols. At 110mg/100g, its vitamin E (tocopherol) content is among the highest of all natural tocopherol sources. By contrast, flax oil contains only trace amounts of vitamin E.
The fatty acid composition of Camelina oil is also unique and very beneficial in terms of its health-promoting qualities. While being a rich source of ALA, the oil is highly monounsaturated, naturally supplying more than 30 percent of stable monounsaturated (oleic and gadoleic) fatty acids. 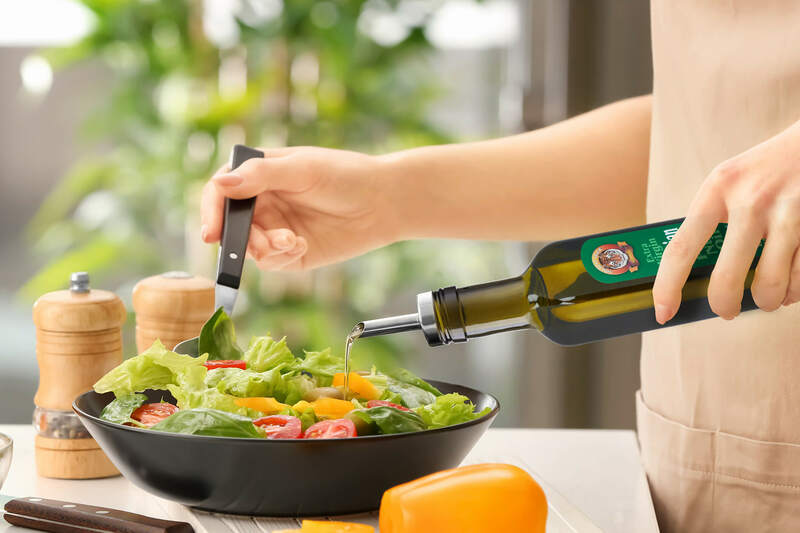 This significant proportion of monounsaturates (monounsaturated olive oil forms the basis of the healthy Mediterranean diet) further enhances the oxidative stability of Camelina oil, and makes it a more versatile cooking oil. Last, but not least, Siberian Camelina oil is relatively low in omega-6 linoleic acid, resulting in a favorable omega-3/omega-6 ratio of up to 3-to-1. This is also a very important benefit, since our diets today are usually oversaturated with omega-6 fatty acids and deficient in omega-3s, resulting in a harmful fatty acid imbalance which may have far-reaching negative consequences for health. The combination of these important advantages makes Siberian Camelina oil one of the most balanced and desirable sources of omega-3 fatty acids. While being almost as abundant in beneficial omega-3s as regular flax oil and fish oil, it is highly stable and rich in vitamin E and other natural antioxidants, as well as healthy monounsaturated fatty acids. As a result, it does not promote the formation of harmful free radicals. On the contrary, it helps your body to resist their destructive effects by providing strong antioxidant protection. The delicate, pleasant taste and aroma of Siberian Camelina oil make it an excellent salad and cooking oil. On our recipes page, you will find many creative ways of using Camelina oil in your kitchen. When taken straight, the recommended dosage is one tablespoon (15 ml) daily, taken at any time.